Marge Beaver's Most Recent Book . 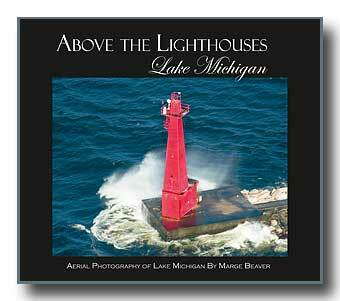 . .
10½"x12" hard cover, 208 pages of gorgeous full color aerial photos with close ups of EVERY lighthouse on Lake Michigan as well as spectacular scenic area views to show their locations. All four seasons are represented, and index maps for each state are included. $49.95 with FREE USA SHIPPING! How should I personalize it? Following the success of my first coffee table style book, Above the North, I had a second book published. This is aerial photography of southwest Michigan, the area where I live and have loved doing aerial photography for the past 30 years. The inside cover flap written by the publisher reads as follows: "These stunning birds-eye views offer rare and beautiful glimpses of rivers, lakes, and shoreline with breathtaking four-season photographs transforming our view of West Michigan into a magical land. From the working harbors and lights along Lake Michigan to the playful inland lakes, to the fruit-covered orchards, spectacular flowers, and fun-filled festivals, these are images of Michigan as you have never seen her before. All of these, plus arresting photographs of winding highways, snake-like rivers, and city harbors make this book a collector's item for anyone who loves Michigan." Signed copies of the books are $45 and USA shipping is FREE! 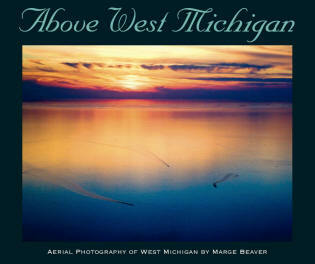 The description on the inside cover flap written by the publisher reads as follows: "These stunning bird's-eye views offer rare and beautiful glimpses of northern Michigan's unique terrain from the lofty perch of photographer Marge Beaver's camera lens. Beaver's breathtaking four-season photographs transform our view of Michigan into a magical land. 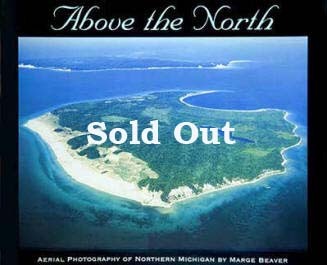 From the Sleeping Bear Dune in winter with its vertiginous sandy edifice, to a Coast Guard cutter shattering the icy Straits, to the ghostly silhouette of a sunken ship and the brilliant turquoise waters of Crystal, Torch, Elk, Charlevoix, and Glen lakes, these are images of Michigan as you've never seen her before. All of these, plus arresting photographs of orchards in snowy-white bloom, winding rivers, and city harbors make this book a collector's item for anyone who loves Michigan." I have two books left that I could sell. If you want to own one of them, let me know if it would be worth $60 to you. The original cost was $45, but there will not be any more printed.